Cinco De Mayo marks Matilda’s second birthday. Matilda marks everything. Today, Matilda got a dish of eggs and bacon in lieu of a cake. There’s plenty of dog birthday cake recipes and special meals to prepare, but a simple arrangement of her favorite foods was just as good. Matilda’s birthday toys are from the Sagoskatt collection from IKEA – they’re based on real children’s drawings. It’s so hard to find dog toys that are lightweight and tiny enough for Matilda to enjoy. She’s in love with these little things. They have little legs that she loves to tug on, and they’re all standing up to her raptor-like jaws. Today is my second birthday so I got my own bacon and eggs, all for me! ??2⃣? If you’re anything like me, you can’t help but remember that dogs don’t know it’s their birthday. They don’t notice whether or not their families celebrate their special day. They have no idea why they’re getting yummy food and lots of attention. This seems kind of sad, at first, but really, it makes dog birthdays even better. Dogs still enjoy the food, toys and attention. They just don’t know the reasoning behind it. And that reason is the saddest part of all – the fact that another year of her short life has elapsed. I realized I’m glad my dog doesn’t know that. I’m glad she’s able to enjoy her birthday spoils with no understanding of how she’s aged, or how she’s just another year closer to leaving us. So, while it might seem that a dog can’t properly enjoy a birthday, the truth is, a dog is the best birthday boy or girl there is. All she knows is, once in a while, out of the blue, she’s going to get a best day ever. She doesn’t anticipate it, look forward to it, or have expectations – she just enjoys it. If you don’t know when your dog was born, celebrate the day you brought her home – her Gotcha! day – or any day at all. For just one day a year, make your dog an extra tasty meal. Something that won’t give her a tummyache. Your dog’s birthday is a time to celebrate with whatever brings her the most joy. For Matilda, that’s a greasy breakfast and some tiny toys. She also gets to play with her best friend Cow and go on a fun walkies, but those are everyday occurrences. How do you celebrate your dog’s birthday? Happy Birthday Matilda! I celebrate each of our dogs birthdays. They are family, even if they don’t understand its their day. Happy Birthday to Matilda! Since we don’t know our dog’s birthday, we give him an extra treat on his gotcha day. Happy Birthday Matilda! 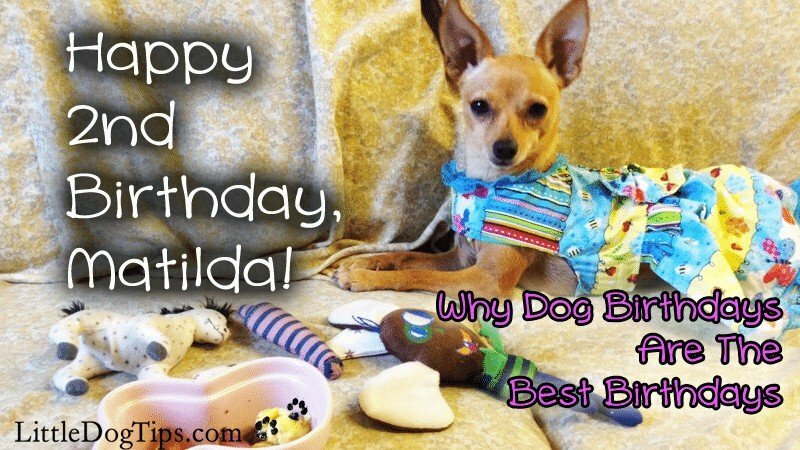 Dog birthdays are indeed the best! Happy birthday, Matilda! Yes, dogs don’t have a concept of birthdays but they sure understand special time and treats. Happy Birthday Matilda! We always celebrate pet birthdays, even for the smaller pets. Pet birthdays are bitter sweet. On one hand, you get to celebrate another awesome year spent with them. On the other hand it is hard to watch our animal friends age. I agree with you, I’m glad my pets can enjoy their special day without worrying about the implications of ageing. Taking copious notes…My 12th birthday is on May 11th! Happy Birthday! We took the dogs to the beach one year. Normally he gets treats and presents. Happy Birthday Matilda. We don’t always celebrate our pet’s birthdays, but we don’t go overboard with the humans either. Instead our pets are pampered and loved all year round, they get random gifts and treats – it’s a good life! Happy birthday to you, happy birthday to you, happy birthday dear Matilda…happy birthday to you! Arrrooo ♥ We always celebrate the boys’ birthdays. I love doggy birthdays because it gives me a chance to pop out new dog-friendly baking recipes! Happy birthday Matilda! We celebrate birthdays with pupcakes, treats and presents here. Happy Birthday Matilda! We celebrate with lots of yummy treats and presents!! Happy Birthday! We’re celebrating Walter’s 4th birthday next Saturday!! I agree – my dogs don’t know why I bake a cake and they’re wearing funny hats but I want to celebrate every year of their beautiful lives. Love your dog’s dress btw – adorable! Kilo loves any excuse to be with us and eat. He will be 4 in August and we will definitely party. Last year I made him his favourite things and gave him toys and played with him. Sarcastic Dog recently posted…Positive training? Correction training? What works? Happy Birthday Matilda!!! We never need an excuse to buy toys and treats but Birthdays would be a fantastic reason. Happy 2nd birthday Matilda. We hope you have many more. Happy belated birthday to Matilda! This kind of celebration seems absolutely perfect! Happy Birthday, Matilda!!! May it be the best ever…until next year’s! FiveSibesMom recently posted…Ode to All Moms: Happy Mother’s Day! Happy birthday! This post is so true. I love it! Happy Barkday Matilda! I love the comment ‘Matilda marks everything’!!! Hope that Matilda had a wonderful day. 2 is the new 1 they say. Tee hee. Cute pics! Happy Belated 2nd Birthday, Matilda! She looked so pretty for her party. It seems like she loved her treats too. 🙂 I celebrate my cat’s birthday, but she gets spoiled every day, so it isn’t much different than any other time. The birthday celebration is more for us humans who want an excuse to celebrate her life. i hope Matilda had a wonderful bday. she looks so cute in her outfit. i hope that you have a long healthy life. many more happy bdays!